2008 Macbook Pro freezes with battery, too much heat? Discussion in 'MacBook Pro' started by absolutebica, Oct 3, 2012. So bought my MacBook Pro off a friend a while back. It was noted the battery was starting to go bad as some alerts were beginning to show about battery capacity not being full, so I knew I would need to replace the battery. Time went by and I never replaced the battery until I went into my briefcase after it had been about 1 month, and the entire battery was bent out from the rest of the laptop. The computer had been off the entire time. I removed it, but the battery had imploded. Was probably 5 inches thick. The symptoms while the battery was still intact was the system couldn't be on for more then 10 minutes until the screen started flickering and it would lock up. My friend had Lion installed prior to giving it to me and it was his everyday computer. He never had an issue with it other then the notifications about the battery needing to get replaced. He wiped it clean, and we tried installing Lion together fresh. We had trouble getting through the install process because it kept freezing up. Installing Lion it seemed to do this, installing Snow Leopard it did not. I think Lion seemed to cause the computer to work harder and would create more heat. I think the battery would cause the system to overheat. Well, 1 week ago I hooked up the laptop without a battery and things have been fine. I honestly didn't even think to try this 6 months ago, lol. I realized the computer seemed to be running fine without a battery, so it just needed a new battery. 1 day ago I received my new battery (OEM, 1189 version) and installed it. I charged it with the laptop closed so it would become full. The battery, via Coconut, said it has 5 power cycles. After 15 minutes, it said 99%, or about 3 hrs 41 minutes left. I saw the screen flicker a few times, and saw it say 2 hrs 4 minutes..and the screen flickering started getting crazy until it froze up (no mouse movement) and the graphics seemed to be crappy. I removed the battery and rebooted, but it eventually did the same thing. The bottom was quite hot. So for some reason, this laptop is having a bad time with any battery. 1). The battery is swelling at least to a point where its putting pressure on the internals. Combined with the heat, and the computer is not happy. 2). The battery is swelling putting pressure, heat isn't an issue. 3). The battery is fine, but the extra heat when running on battery alone is causing the internals to not work properly. I am leaning toward #1, because I think the fact the battery is in that spot combined with the heat is causing a bad chain of events, even if its not swelling. I do think heat is the key component. Any thoughts guys. I am seriously frustrated. Do you have the same issue when just using the psu? (i.e. take the battery out and just use the external power adapter) If you do then it's likely a gpu issue, thats a common problem for mbp's from that era. No, when I have the power cord connected, and the battery is removed it behaves just fine. The only time it screwed up was when the bottom was still hot just after removing the battery after it screwed up. It's still possible that it could be a GPU issue. Its also possible that the batter exploding defomed the case so that when you put the battery back in it deformes the case putting pressure on something it shouldn't (most likely a cable or the logic board). You can always take the laptop in to the Apple store to have it diagnosed for GPU failure or you can go to iFixit.com and follow the teardowns to see if anything is bent/cut or worst fried. Keep in mind its not for the faint of heart. Ok, had it happen again tonight. Had the computer on for 10 minutes, and decided to load a bunch of programs (Photoshop, illustrator, chrome, firefox) and had a youtube movie playing. Also, I pulled the battery out and it appeared, to me, to slightly be swollen. This is a brand new battery that had been in for only 10 minutes. I squeeze the center and you can hear the metal stick to the batterys briefly. Also, here is a picture of the "slight" bulge I think is there. 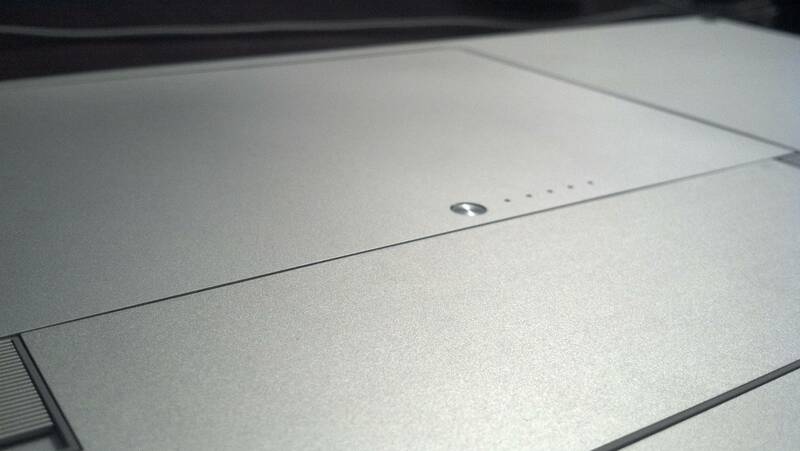 just an fyi, I placed things under all 4 corners to create a gap under the laptop. I installed the smcFanControl app. The computer was hanging around 52-54 degrees Celsius. I didn't look at it just before playing a youtube video, but once I did...the screen started going wacky again like in that video, and the computer temperature was at 60 degrees. The fans were around 2000 rpm, even though I told SCM to go up to 4500. I am not quite sure what to think right now. With the battery, did you get the new one from Apple or did you purchase it somewhere else? If you decide to get another one, get it straight from Apple. There's less of a chance that you'll have problems with it. The expanding battery from before definitely could have caused some problems for your machine...having it putting pressure on all the internals for a few months is definitely not a good thing. It doesn't sound like it's a heat issue....I'm thinking GPU problem. You said you have problems with it freezing when you ran a bunch of programs (Photoshop, Illustrator, Chrome). Is this a 15" MBP? If it is, I'm thinking you might have a problem with the discrete graphics card. Chrome on it's own will usually trigger the discrete card, and I believe Photoshop does, as well. If it is the 15" MBP, you might want to try installing gfxcardstatus. It's an app that tells you which graphics card is currently being used, and lets you switch between the two. Maybe it can help you narrow down the problem? It's either a 15" or a 17". Not sure, the max screen resolution is NOT 1900x1200, its lower then that. I think my friend had snow leapard on it prior to Lion and it ran fine. Though I remember him saying he upgraded to Lion and ran it fine for a while. So not really sure there. I will run that GFcard status. However, wouldn't that still be an issue even without the battery? As mentioned before, seems to run just fine without the battery. From what I understand, when you run the MBP without a battery, it throttles the processor quite a lot. That's because if the machine is running full tilt doing heavy processing, it can potentially pull more power than the power cable can provide. Since there would be no battery for it to pull that extra power from, it would cause it to shut down. To prevent that, the CPU is throttled to reduce the power usage. I don't know for sure, but it might also prevent the discrete graphics card from kicking in. If the problem is with the discrete card, and running without a battery prevents the discrete card from being used, then that could be your answer. It's just a guess on my part, though. Damnit...now my machine when trying to boot up keeps getting the kernel panic screen. I have reset my PRAM. going to try safe mode next. http://support.apple.com/kb/TS2377 regarding my graphics card. Though again, my buddy who had this for years never ran into these problems. Also, this is a single GPU, so the gfxstatuscard won't work. Wanted to update the thread. So I went out to Nvidia's website, as I feared this might be a graphic driver issue, and updated myself to the Nvidia Cuda drivers. I also installed the smcFanControl app... and I ran a couple of tests. I think the graphic drivers have made a difference, however I got so confident at one point that I didn't need the SMC app, that I disabled it..and started loading a ton of apps. I froze my computer again with all the funky graphics and blinking. So strike 1. However, I loaded up the SMC fan control again and I keep the RPM's between 3000 and 4200. I have a "low usage" mode where its plugged in and a default mode for battery which puts it at 4200. I find that when too many apps are running, the temp gets near 170-180 degrees and that is when bad things happen. In fact, after doing the graphic driver test...and putting the battery in within 2 minutes it went from 115 degrees Fahrenheit to 205. Normal working temp for me is between 80 - 120 degrees. I hope that is normal. So far the combo of SMC and the Nvidia Cuda update seems to have worked for me. In all honesty, it sounds to me like you have a faulty graphics card. I had a 2007 Macbook pro (same style as yours) that developed a weird display fault, but worse then that. It went away a day after leaving it off, two days later it reappared when editing 20mpixel files in Aperture. Seems to me like it is motherboard/graphics card related.